The Measure 3d has been in Amped Five for years, and it’s certainly one of the most reliable and quick ways to calculate the height of a subject or another distance from an image or video. In the latest version of Five, we have added several improvements, like the possibility to select the layers of calibration lines to show on the picture, and the possibility to draw free hand lines (not constrained by the perspective) to help with the estimation of ground floor points. Thanks to the calibration of the perspective, once you set the reference measurement, you’ll know automatically the height of the center of the camera optics from the ground. You can simply read the value from the Camera Position parameter in the Reference tab. Of course, it’s subject as always to the measure error as any other measure taken with this system, but it can be useful for different purposes. 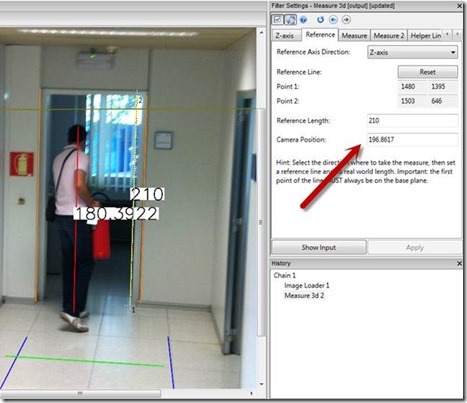 For example, you may want to verify that a camera has not been moved after an event. Another use for this could be to calculate the position from where a picture have been shot with a digital camera,so you can estimate the position of the photographer relative to the subject. This entry was posted in FIVE, How to, New features on September 25, 2013 by Martino Jerian.